Metropolitan Michael Bzdel goes to Rome to celebrate the 400th anniversary of the Union of Brest, Rome, Italy, July 7, 1996. On far left is Father Lonchyna, later ordained Bishop for immigrants outside Ukraine. 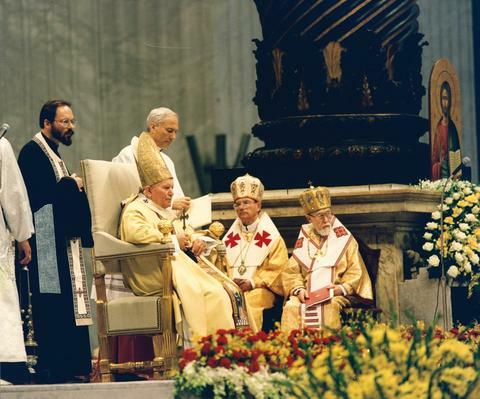 Pope John Paul II is beside him, with Metropolitan Michael Bzdel and Cardinal Lubachivsky to his right. Copyright on this image belongs to the Ukrainian Catholic Archeparchy of Winnipeg Archives. Researchers are responsible for observing Canadian copyright regulations.